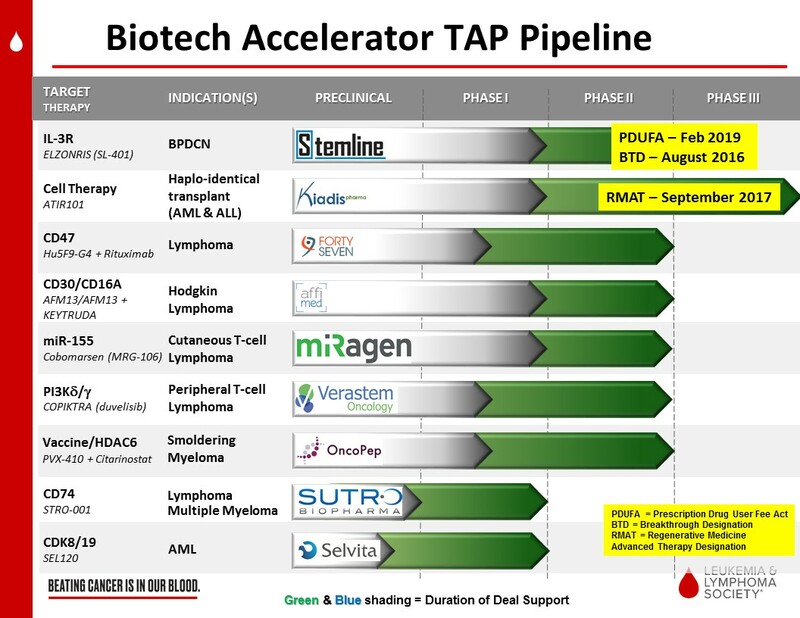 The Biotechnology Accelerator Division identifies companies developing novel anti-cancer therapies, supportive care or diagnostics and co-funds specific projects that will enable a company to partner or raise additional funding to complete the testing, registration and marketing of new therapies or diagnostics for blood cancer indications. For information on how to apply to TAP, please click here. This is a non-randomized, open-label, multi center study. A cycle of therapy is 5 consecutive days every 21 days for 6 or more cycles. Stage 1 will consist of a brief run-in period in which patients with BPDCN (previously untreated and previously treated) and AML (persistent/recurrent and previously untreated) will be treated with SL-401 at 3 dose levels. During Stage 2, two cohorts of BPDCN and AML patients will be treated at the maximum tolerated dose or maximum tested dose in which multiple dose-limiting toxicities are not observed (identified in Stage 1). Visit the Stemline Therapeutics website for additional information and view this informational video - SL-401: An Encouraging Option for Patients With Blastic Plasmacytoid Dendritic Cell Neoplasm. The primary objective of this study is to compare safety and efficacy of a haploidentical T-cell depleted HSCT and adjunctive treatment with ATIR101 versus a haploidentical T cell replete HSCT with post-transplant administration of high dose cyclophosphamide (PTCy) in patients with a hematologic malignancy. An additional objective of the study is to compare the effect of the two treatments on quality of life. This Phase 1b/2 trial will evaluate Hu5F9-G4 in combination with rituximab. Hu5F9-G4 is a monoclonal antibody which is designed to block a protein called CD47, which is widely expressed on human cancer cells. Blocking CD47 with Hu5F9-G4 may enable the body's immune system to find and destroy the cancer cells. Rituximab is a monoclonal antibody drug that is used for treatment of non-Hodgkin's lymphoma and other types of cancer. The major aims of the trial are: (Phase 1b) to investigate the safety and tolerability of sequential dose cohorts and to determine a recommended Phase 2 dose for Hu5F9-G4 in combination with rituximab, and (Phase 2) to evaluate the efficacy of Hu5F9-G4 in combination with rituximab in patients with indolent lymphoma or diffuse large B-cell lymphoma as measured by the overall response rate. Visit the Forty Seven website for additional information. The purpose of this study is to establish a dosing regimen for the combination therapy of AFM13 and pembrolizumab (MK-3475) in patients with relapsed or refractory (R/R) Hodgkin Lymphoma (HL) and to assess the safety and tolerability of this combination therapy. The main objective of this clinical trial is to study the efficacy and safety of cobomarsen (also known as MRG-106) for the treatment of cutaneous T-cell lymphoma (CTCL), mycosis fungoides (MF) subtype. Cobomarsen is designed to inhibit the activity of a molecule called miR-155 that may be important to the growth and survival of MF cancer cells. The study will compare the effects of cobomarsen to vorinostat, a drug that has been approved for the treatment of CTCL in the United States, Canada, and Australia. Participants will be randomly assigned to receive either weekly doses of cobomarsen or daily doses of vorinostat. Participants will continue on their assigned treatment as long as their disease does not get worse or as long as they do not have unacceptable side effects. The effects of treatment will be measured based on changes in skin lesion severity, disease-associated symptoms, and quality of life, as well as the length of time that the subject's disease remains stable or improved, without evidence of disease progression. The safety and tolerability of cobomarsen will be assessed based on the frequency and severity of observed side effects. Participants assigned to receive vorinostat who experience progression of their disease during their participation in this study may have the option to be treated with cobomarsen in a separate clinical trial, if they meet the entry criteria for that study. Visit the miRagen website for additional information. This research study is a Phase I clinical trial, which tests the safety of an investigational intervention and also tries to define the appropriate dose of the investigational intervention to use for further studies. "Investigational" means that the intervention is being studied. In this research study, the investigators are studying Smoldering Multiple Myeloma. Smoldering Multiple Myeloma is an early precursor to a rare blood cancer known as Multiple Myeloma, which affects plasma cells. The study will test two different combinations of the study drugs; a combination of the vaccine (PVX-410) along with Citarinostat (CC-96241) and triple combination of the vaccine, Citarinostat, and Lenalidomide. The vaccine (PVX-410) is a multi-peptide vaccine that contains four synthetic peptides that together are intended to induce a T cell-mediated immune response against the myeloma. The FDA (the U.S. Food and Drug Administration) has not approved PVX-410 as a treatment for any disease. Citarinostat is an orally active, small-molecule Histone Deacetylase (HDAC) Inhibitor which is being combined here to further augment the immune activity of the vaccine. Citarinostat has not been approved by the FDA as a treatment for any disease. Lenalidomide is commercially available analogue of thalidomide with immunomodulatory, antiangiogenic, and antineoplastic properties that has demonstrated an increase in immune activity in previous trials. The FDA has approved Lenalidomide as a treatment option for Smoldering Multiple Myeloma. Lenalidomide is being added to the combination of the vaccine and Citarinostat because it is hypothesized that co-administration of lenalidomide along with Citarinostat would further enhance the T cell-mediated immune response induced by PVX-410. Visit the OncoPep website for additional information. This study is a first-in-human Phase 1, open-label, multicenter, dose escalation study with dose expansion to identify the maximum tolerated dose (MTD), the recommended phase 2 doses (RP2D) and to evaluate the safety, tolerability, and preliminary anti-tumor activity of STRO-001 in adult subjects with B-cell malignancies (MM and NHL) who are refractory to, or intolerant of, all established therapy known to provide clinical benefit for their condition (i.e., trial subjects must not be candidates for any regimens known to provide clinical benefit). The study will consist of two parts: Part 1, dose escalation, and Part 2, dose expansion. During Part 1 (dose escalation), an accelerated dose titration design will be applied to cohorts A (MM) and B (NHL). Doses will be escalated using an N-of-1 until the first instance of a treatment-related, clinically relevant Grade 2 non-hematologic toxicity or a Grade 3 hematologic toxicity of any type is observed during Cycle 1 (first 28 days). Any event meeting these criteria will be reviewed and confirmed by the Safety Evaluation Team (SET). Each dose escalation cohort will be assessed independently. When these criteria are met then the dose is expanded with 2 additional subjects and the standard 3+3 trial design is used for all further dosing cohorts. The dose escalation (Part 1) phase of the study will be complete when the MTD is determined and the recommended dose for Part 2 (dose expansion) is identified. The RP2D will be selected based on the safety, tolerability and exposure of STRO-001, and will be the end of Part 1 of the study. After determination of the RP2D, subjects with MM or NHL will be enrolled into indication specific dose expansion cohorts (Part 2). The accelerated dose titration (N-of-1) design with seamless transformation into a traditional 3+3 design allows for very low starting doses to be evaluated in fewer patients. Visit the Sutro website for additional information. SEL120 is an ATP-competitive and selective inhibitor of CDK8 and a closely related serine kinase, CDK19. CDK8 is a part of a multi-protein complex that regulates gene expression and is distinct from CDK4 or CDK6, which play a role in cell cycle progression. In laboratory experiments, treatment with SEL120 has been shown to result in the death of AML cells especially with elevated phosphorylation of STAT5 and stem cell characteristics, which is significant because AML stem cells are typically resistant to conventional therapies and thereby mediate relapsed disease. Moreover, the status of phosphorylation of STAT5 may provide a useful biomarker for action of the drug. The molecular mechanism of action involves modulation of various oncogenic transcriptional programs that are critical to the survival of AML cells. This unique mechanism, which does not overlap with existing therapies, may allow the development of highly effective combination therapies that may be required to provide long term control of AML in patients. SEL120 has shown efficacy in treating AML cells both in vitro and in vivo (mouse models). SEL120 has successfully passed a series of non-GLP toxicity studies in mice and monkeys. Selvita initiated Investigational New Drug (IND)-enabling studies for SEL120 in June 2017, a critical step in getting the U.S. Food and Drug Administration’s permission to begin in human clinical trials. Visit the Selvita website for additional information. Verastem plans to conduct certain translational and clinical activities relating to the development of duvelisib for the treatment of PTCL. LLS and Verastem will share the cost of the development program, portions of which will be conducted in collaboration with Memorial Sloan Kettering Cancer Center, The Dana-Farber Cancer Institute, The Washington Universityin St. Louis and Stanford University. Duvelisib is an oral inhibitor of phosphoinositide 3-kinase (PI3K), and the first approved dual inhibitor of PI3K-delta and PI3K-gamma, that has demonstrated clinical activity in a Phase 1 clinical trial in 16 heavily pre-treated patients with relapsed or refractory PTCL (Horwitz, et al. Blood. Feb 2018). Results from the study showed duvelisib demonstrated a 50% overall response rate, including 19% complete responses. Verastem Oncology is currently conducting an open-label, multicenter, Phase 2 clinical trial (the PRIMO study) evaluating the efficacy and safety of duvelisib monotherapy in adult patients with histologically confirmed relapsed or refractory PTCL. This study is expected to enroll approximately 120 patients. In addition, funds from the TAP will be used to support the expansion of an investigator-sponsored study being conducted by Steven Horwitz, MD, Medical Oncologist, Memorial Sloan Kettering Cancer Center and NYC Health + Hospitals/Bellevue. This study is evaluating the combination of duvelisib with romidepsin, an HDAC inhibitor, with a goal to create deeper and more durable responses for patients with relapsed or refractory PTCL. Initial data on the combination as presented at the American Society of Hematology (ASH) 2017 Annual Meeting, demonstrated a 64% overall response rate including 34% complete responses. Visit the Verastem website for additional information. TAP builds business alliances and collaborations with companies. The funding TAP provides is not a grant, nor for building the company's infrastructure. It is designed to complement the company resources to accelerate the development of a therapeutic asset, supportive care or diagnostic. The TAP team reviews all companies that make an inquiry but will only invite those deemed to meet diligence criteria to complete a proposal template and be considered for TAP funding. To submit an inquiry for initial non-confidential review, please click here to download the form. Send a completed inquiry form and non-confidential presentation to Dr. Jun Xu, Executive Director, Therapy Acceleration Program®, The Leukemia & Lymphoma Society, 3 International Drive, Suite 200, Rye Brook, NY 10573; jun.xu@lls.org.